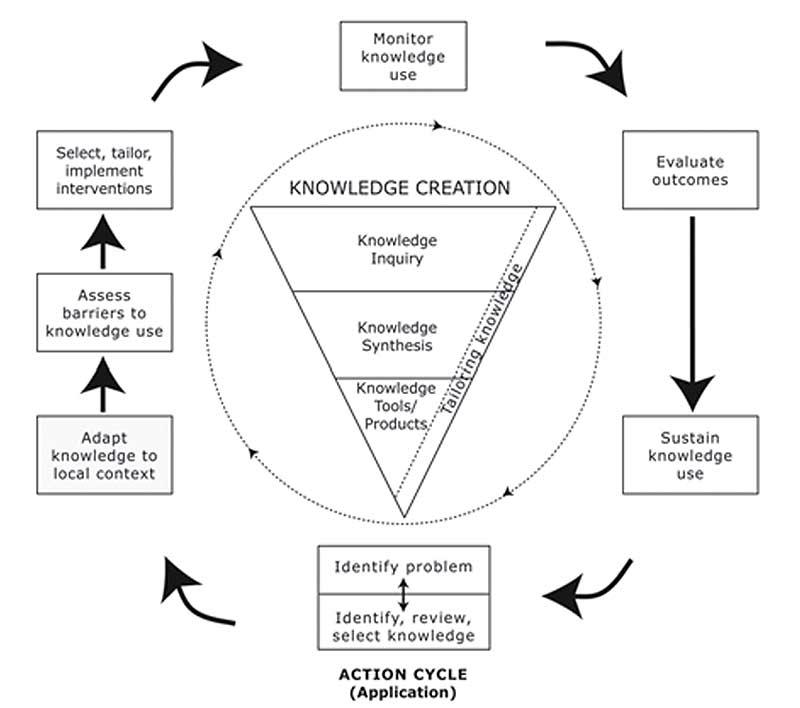 To identify the best available evidence and apply it to practice, the therapist follows the “Knowledge Translation Action Cycle” (see graphic below). STEP 1 – Identify the Problem: Clearly identify the specific topic to be explored. STEP 4 – Adapt Knowledge to Local Context: Assess the values, usefulness, and appropriateness of the knowledge to the particular setting and circumstances, and customize accordingly. STEP 5 – Assess Barriers and Knowledge Use: Assess for barriers that may limit the application of the knowledge so that these barriers may be targeted by intervention strategies (e.g., need for increased direct treatment time with clients). STEP 6 – Select, Tailor, and Implement Interventions: Select, tailor, and execute interventions to implement the knowledge (develop a “Knowledge Translation Plan” – see the “Home” tab to view Knowledge Translation Plans developed by students), as well as promote awareness of the knowledge to others. STEP 7 – Monitor Knowledge Use: Measure for desired changes in level of knowledge, understanding, attitudes, and/or changes in behavior or practice of the clinicians. STEP 8 – Evaluate Outcomes: Measure whether application of the knowledge has improved the identified outcomes (e.g., decreased depressive symptoms). STEP 9 – Sustain Knowledge Use: Plan and manage changes to the implementation strategies (the “Knowledge Translation Plan”) in response to the ever-evolving environment, context, and barriers by cycling back through the action cycle. The Center on Knowledge Translation for Disability and Rehabilitation Research (KTDRR) created a FREE Webinar Series titled “Systematic Review: From Evidence to Recommendations”. Click here to access the webinars.